Pad See Ew is one of my favorite dishes to order when we go to a Thai restaurant and I don’t know what took me so long to try it at home. It makes me really happy I made the resolution to cook new cuisines and go a bit outside my normal routine. Who knows if I would have ever tried it otherwise. If you don’t frequent Thai restaurants you may not have heard of Pad Sew Ew. I know I hadn’t until a few years ago. 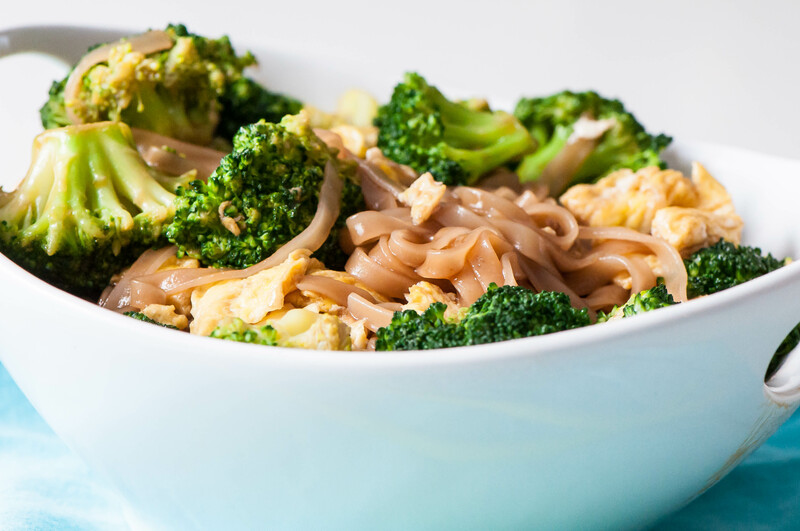 Rice noodles are stir fried with eggs, broccoli, soy sauce and oyster sauce to create a simple yet delicious dish. Traditionally, there is chicken or pork which you can add if you choose but I decided to skip them to keep it on the lighter side. Since we are talking about Thai food, another one of our favorites is Pad Thai so make sure you check that out too. The ingredients are quite similar but Pad Thai is sweeter and has a crunch from the peanuts while Pad See Ew has a saltier, almost briny flavor. I didn’t notice until after that I used the exact same serving bowl in the photos for both of these dishes that were shared years apart. I love that white bowl. I have another Thai recipe to share with you all, maybe the best one that we tried, but I’m not sure it’ll fit into this month’s schedule but keep an eye out for it sometime soon. It’s kind of magical. And when I say kind of, I mean it is totally and utterly amazing. But for now, eat a big bowl of this pasta. You totally won’t regret it. Cook noodles according to package directions. Rinse with cold water and set aside. Meanwhile, bring a saucepan of water large enough to hold the broccoli to a boil. Cook broccoli for 1 minute then remove with a slotted spoon to an ice bath to shock it and prevent it from further cooking. Once cool, drain and set aside. In a small bowl, stir together the soy sauce, oyster sauce and brown sugar. Set aside. Heat a wok over high heat. Add 1 tablespoon of oil then garlic and stir fry for 30 seconds, until fragrant. Add eggs and cook, stirring constantly, until set. Remove from wok. Add remaining 1 tablespoon oil. Once hot, add noodles, broccoli, sauce and eggs. Stir to combine. Stir fry for 2 minutes. Serve immediately.